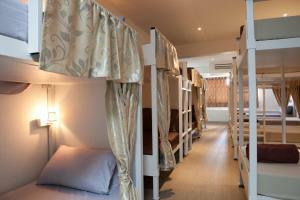 Located in Chaweng, Hello Backpacker Samui Hostel is a perfect starting point from which to explore Samui. The hotel offers a high standard of service and amenities to suit the individual needs of all travelers. Free Wi-Fi in all rooms, convenience store, daily housekeeping, postal service, taxi service are just some of the facilities on offer. Some of the well-appointed guestrooms feature television LCD/plasma screen, internet access – wireless, internet access – wireless (complimentary), non smoking rooms, air conditioning. Recuperate from a full day of sightseeing in the comfort of your room or take advantage of the hotel's recreational facilities, including boats, badminton court, bowling alley, diving, fishing. Hello Backpacker Samui Hostel combines warm hospitality with a lovely ambiance to make your stay in Samui unforgettable.